Compelling content is the cornerstone of Internet marketing. No matter how strong your branding is or how beautiful your website looks, content is needed to move people through the purchasing funnel. Without content, nothing else really matters. Getting your content to do its job isn’t an easy feat, though. I’ve written before how content has become a commodity, and is easier and cheaper to get than ever before. “Easy” and “cheap” don’t often translate into “good,” however, and that is absolutely the case with website content. Your content needs a number of things to thrive: the right tone, the proper industry vocabulary, and effective calls to action. Most of all, though, it needs to be written about a topic that people are interested in. Keyword research might be one of the oldest tricks in the book, with regards to SEO, but it still works and will keep your content relevant to your target market. Remember: your content is only compelling if people are around to read it. To make sure people will see it, you need to make sure your content is properly optimized for the right keywords. Here’s how to identify the quality keywords that will attract the most visitors to your website. Before we dig into keyword research, we need to make sure our overall content strategy is formulated for success. 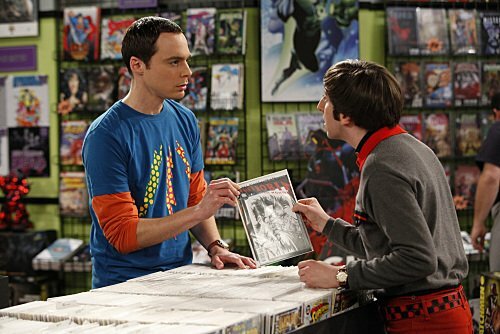 Unless you are Sheldon Cooper, people aren’t always going to show up on your site and become a customer with the snap of a finger. Now more than ever, consumers play the role of careful researcher, and need time and information to move through the purchasing funnel. The keywords that we select to include within our content need to be varied and speak to a number of different audiences. If they aren’t chosen with care, they won’t attract leads and buyers at every stage of the decision-making process. One of the greatest benefits of compelling content is that it can speak to people at all stages of the purchasing funnel. You can have pages optimized for keywords targeting people ready to buy (“credit card in hand”) and other pages optimized for people at the very top of the funnel who are conducting research on your industry. They are all uniquely valuable visits for your business, and the best vehicle to drive these people to your site is content. When Do You Need A Divorce Attorney? What Do Divorce Attorneys Do? Cost of Representation: How Much Does a Divorce Attorney Cost? Each of these articles attracts a unique set of people to the page with different inherent needs. By remaining mindful of the purchasing funnel and doing careful keyword research, you can make sure that your website speaks to each of these groups effectively. Before starting to identify specific keywords that you want to target with your website, come up with a list of “buckets” from the purchasing funnel that keywords will fall into. There is no universal way to do this but the simplest approach would be to use two keyword buckets: informational queries and transactional queries. Each of these buckets can help provide a roadmap for the keyword research process and make sure that your site has a balance of different types of content. There are a number of free keyword research tools out there that you can use to uncover hidden gems for both buckets of the purchasing funnel. If you are going to use these two buckets to guide your content strategy, plan on doing content based on a mix of 50% informational keywords and 50% transactional ones. This will give you a good balance and keep your strategy equally focused on long-term and short-term prospects. For these top-of-funnel queries, a good rule of thumb is to answer common questions that people have about your industry. 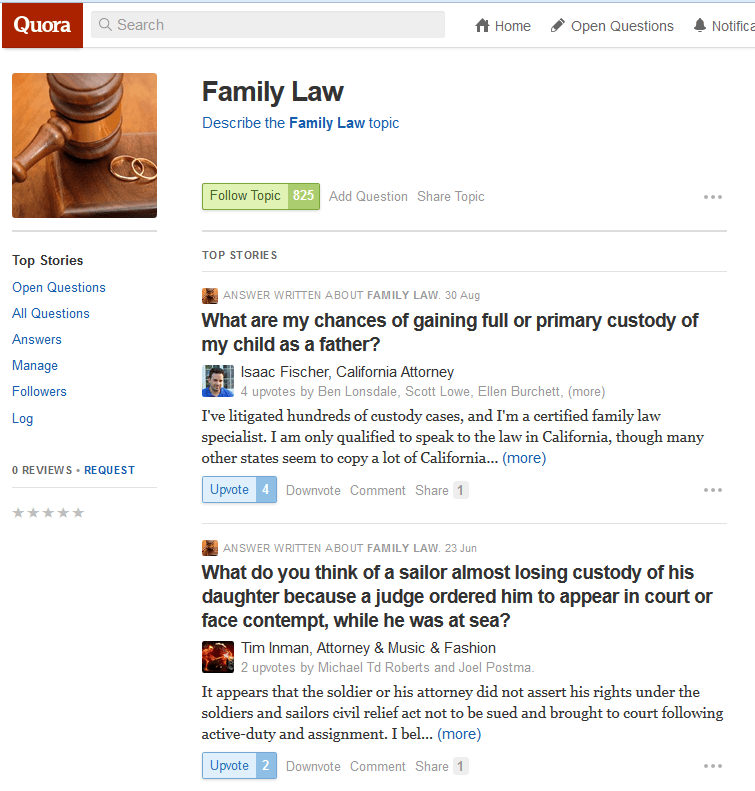 Informational queries are often done in the form of questions: What is a widget? How do widgets work? When do I need a widget? These types of keywords aren’t likely to result in lots of direct revenue, but they introduce people to your brand, and can drive lots of first-time visitors to your website. As they move through the purchasing funnel, these visitors become more valuable, and your website will (hopefully) be the first place they think of when they reach the middle and bottom of the funnel and are ready to make a purchase. To uncover keyword for informational queries, find where people are asking questions and participating in conversations online. My favorite sites for this are UberSuggest and Quora. I like both of these sites because the topics and suggestions are 100% user driven. UberSuggest pulls keywords from real Google searches and Quora has a massive warehouse of user-generated content. Find common topics and write helpful, information-packed guides that answer the questions people are asking. This will drive traffic through new keywords and position your brand as an industry leader. How Do I Know If A Divorce Attorney Is Good? What Are The Common Problems Faced By Divorce Attorneys? What should I do if I caught my wife cheating on me? In a divorce would I have to be ordered to pay off my spouse’s debt? In your experience, who pays more for divorce, men or women? Please include any objective info or stats. Legal Issues and Law in Everyday Life: Should you have a prenuptial agreement in place before getting married? These people have done their research, know what they want, and are ready to make a decision about which business to work with. In terms of value per visit, this bucket is your real money maker. If you aren’t speaking to this audience, you are in trouble. Searchers who are ready to sign up or purchase today have a renewed sense of urgency in the queries that they typically use. Google’s Keyword Planner tool is a great way to pull in some specific keywords for this bucket. You can use Google’s estimated Cost Per Click to determine how much commercial intent (that is, intent to make a purchase)and long-term value is behind each click. If somebody searches for “find divorce lawyer” the CPC is $30.87, whereas a broader, more informational search for “divorce lawyer” comes in at $19.61. The higher CPC keywords should be your main focus in this stage of keyword research. That’s where the most value can be found. 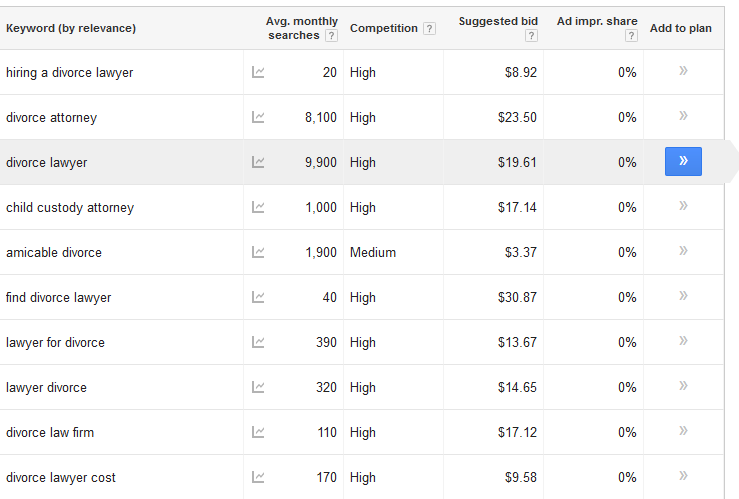 Manually type in some queries or plug in a competitor’s website into Google Keyword Planner to start generating ideas. After just a few minutes, you can grab hundreds of keywords from the Keyword Planner that people are searching. These are people who are ready to become new clients of our fictitious law firm. You absolutely need pages on your site that are devoted to increasing your visibility in search engines based on these keywords. Keyword research can be tricky, but if you come up with an overall content strategy and stick to it, you’ll be well on your way to successfully marketing your website in search engines. It is easy to get caught up in the bells and whistles of other marketing tactics, but few activities will provide the long-term ROI of solid keyword research and content creation. Take some time to use the tools and strategies highlighted above to carefully identify and select quality keywords for your business. Over the course of a few years, a simple informational content page can speak to thousands of potential prospects, and a well-targeted transactional page can close more deals than a thousand cold calls ever will. Trevin Shirey is the Sr. Business Development Manager at WebFX. He has worked on over 300 marketing campaigns ranging from family owned small businesses to publicly traded companies. His work has been featured by Entrepreneur.com, USA Today, Fast Company and Inc.